Let’s demystify the sorcery behind the relationship between performance driving and camber. To understand this relationship, we should first define what camber really is. Camber (kambər) – The angle of a tire relative to the driving surface. Now, many enthusiasts are under the impression that negative camber is just a way to install ridiculously wide wheel and stretched tire fitments under their fenders – a way to get “hellaflush” status and Instagram fame. We have the pleasure of holding lengthy discussions with our clients in regards to wheel and tire fitment, track preparation and all things related to squeezing the most out of their machine, and we often discover through these interactions that enthusiasts new to the sport carry a sour connotation with negative camber, and a general misunderstanding of the role it plays in the world of performance driving. It is true that aggressive amounts of negative camber can help you stuff those new, wider rollers under your car, but it happens to serve a greater purpose, one that is foundational in the world of Motorsports; tire bite. There are other factors at play when discussing proper chassis setup like toe and caster, however this article will focus on the specifics of camber. As the photo below depicts, a car has; zero negative camber when the tire sits perpendicular with the road, negative camber when the tire leans in towards the centerline of the vehicle, and positive camber when the tire is tilted away from the centerline of the vehicle. It’s with good reason your Grandma’s Buick comes from the factory with very neutral alignment settings encompassing very little camber. For your average daily drivers out there commuting to work, dropping kids off at soccer practice, or making trips to the grocery store, neutral alignment settings with minimal camber lends itself to tire longevity and promotes overall stability and predictability for the driver. As a tire makes contact with the road surface, it creates a contact patch which is where grip is generated, and a car setup from the factory will generate its largest contact patch while driving in a straight line. 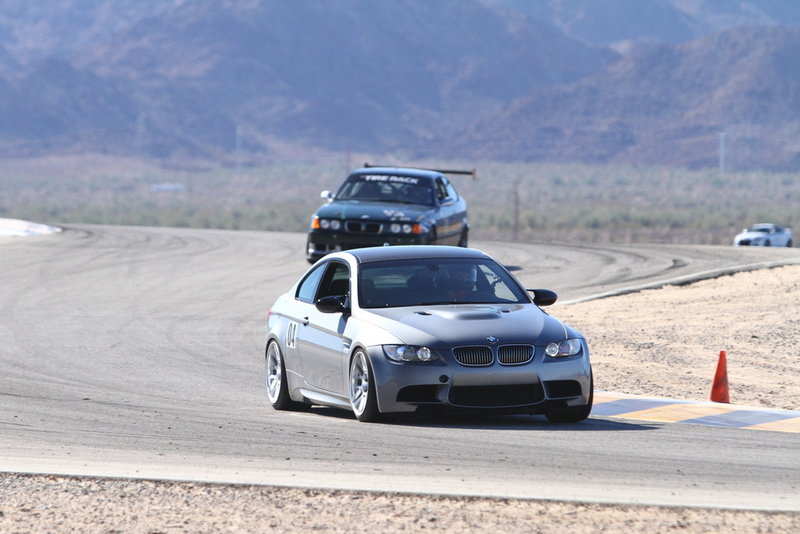 As enthusiasts, we enjoy pushing our cars to their limits, and whether you enjoy spirited driving through back canyon roads or you are fighting for position in a competitive race environment, the car must maintain superior levels of grip throughout the corners as well. As a car is thrown viscously into a corner, it experiences lateral G’s which results in the outer tires gaining positive camber. In other words, the outer tires roll over to the shoulders reducing the contact patch, and this results in less grip. It is important to note that various suspension designs will operate and react differently under compression, but to keep things concise, this article focuses on the relationship between camber and the common MacPherson strut design found on most road going vehicles today. 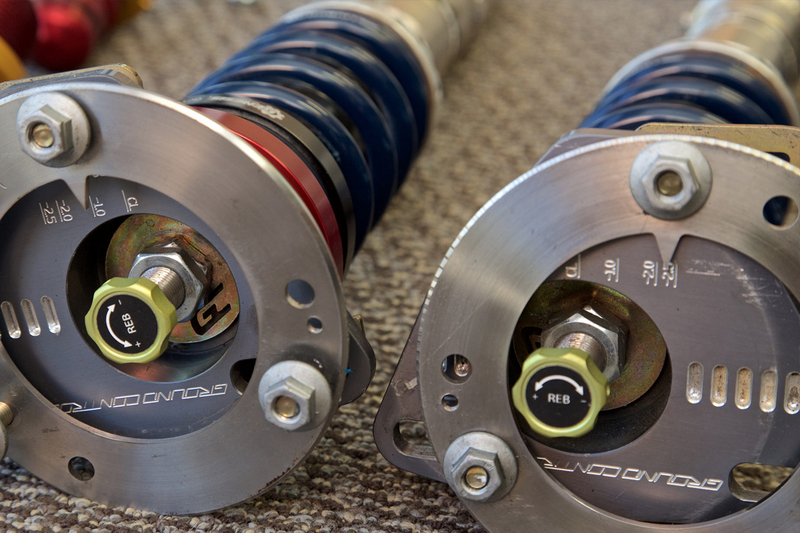 Notably, the MacPherson strut does not gain much negative camber upon compression, therefore we must dial in static negative camber or camber dialed in on a flat surface while the car is stationary, to counteract the heavy forces endured during cornering. Now, as the car dives into a corner with the appropriate amount of static negative camber, the outside tires will come close to zeroing out- ideally maintaining low levels of negative camber maximizing the contact patch. All of this ultimately contributes to the driver’s ability to maintain higher levels of speed throughout the road course. How much camber is enough? Simply asking how much camber is right for you is like asking a tailor to size you for a suit using a pixelated photograph. Consulting experts like a driving coach, the elderly gentleman with the crazy fast Miata at your local track, or an APEX product specialist is a great starting point. 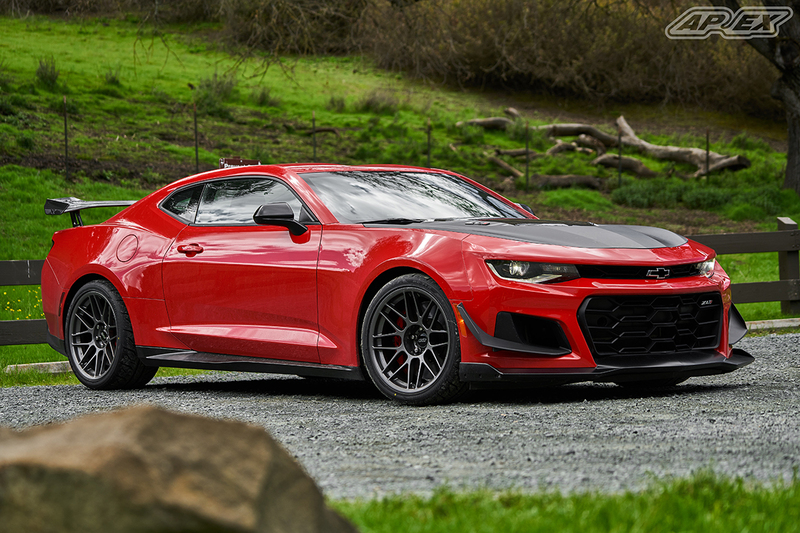 Performance driving enthusiasts come to the table with different tire compounds, suspension types, driving styles and overall goals for their car. All of those variables will cause your desired camber specs to differ greatly. 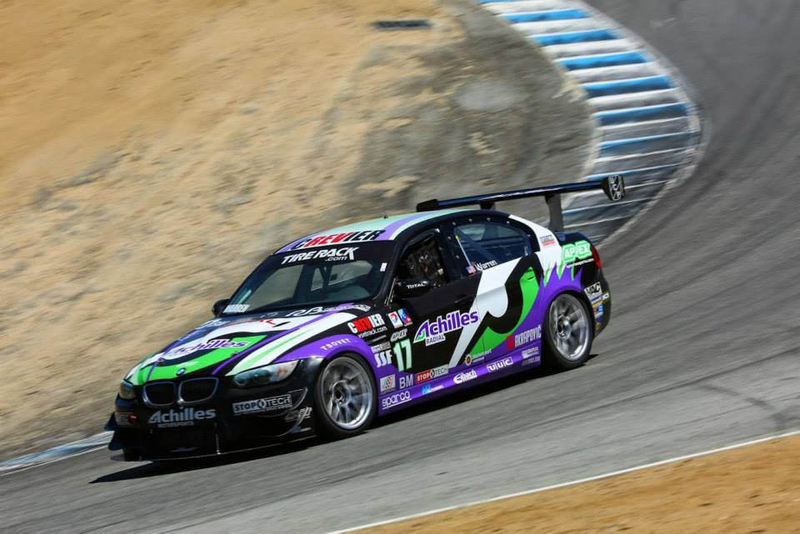 In competitive levels of Motorsports, things become much more technical, and variables like track location and course layout will heavily impact how engineers set up the suspension and alignment to be most competitive for that particular event. With that said, there are some baseline specifications that us mere mortals can use as a benchmark. You can buy a suit off the rack, close to your size, then have it altered by a tailor for a perfect fit. You can also use benchmark negative camber specifications based on the tire compound you plan to use, as well as how often you plan to use the car on and off the track. If you are looking to install a particularly wide wheel and tire combination respective to a particular chassis, and a specific amount of negative is required to create more clearance from the top of the tire to the edges of the front fenders, this too may influence your camber specifications. How can I dial in negative camber? Unfortunately, camber is not really something you can set up using a jack stand, a hammer, and a few love taps. Before driving to a local alignment shop and getting arrested for demanding camber, let’s discuss a few ways in which these adjustments are possible. In most situations, the factory suspension components up front are not adjustable. Enthusiasts would need to add camber plates to the equation. 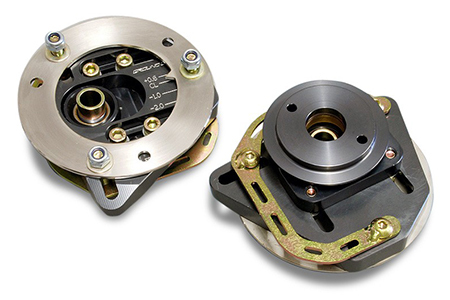 Now, there are two types of camber plates: a fixed plate and an adjustable plate. It’s pretty intuitive, fixed camber plates offer a predetermined fixed amount of negative camber, while adjustable camber plates offer a wider range of adjustments ranging from street car to I shouldn’t be driving this on the street car. If you question whether fixed or adjustable is right for you, contact an APEX product specialist. 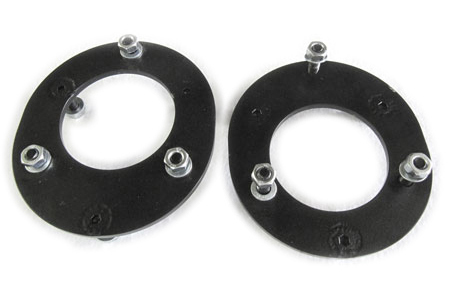 Aftermarket adjustable camber plates will typically set you back around $300 – $500 depending on the brand and application, while fixed plates are typically a bit cheaper. Yes, this is yet another aftermarket modification that will inevitably rob from your kids college fund, but it is important to note that the initial fixed cost and achieved benefits significantly outweigh the costs of rifling through expensive track tires every other weekend. 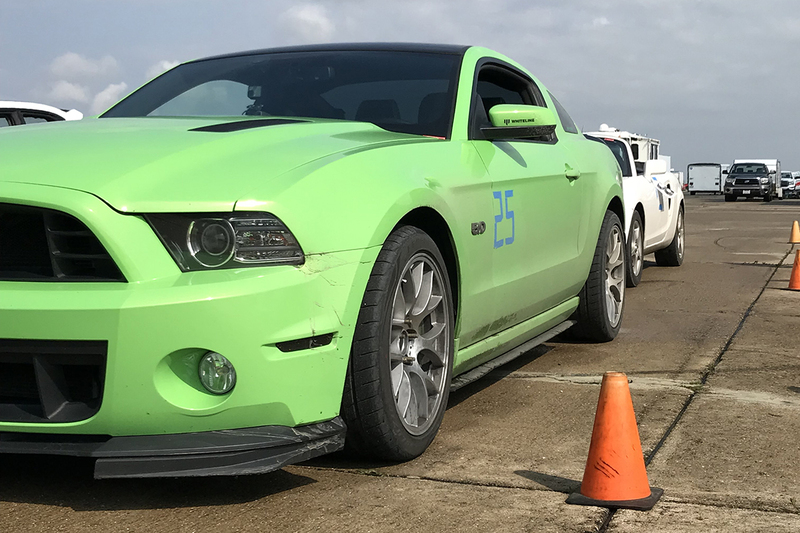 Some chassis are harder on tires than others, but attending high performance driving events (HPDE) or autocross events without negative camber dialed in will quickly result in premature tire wear. More specifically the outer shoulders of the tires will take an absolute beating corner after corner, often times turning shades of blue due to the extreme levels of heat. The moral of the story here is that camber plates quickly pay for themselves. Generally speaking, the rear of a car does not require nearly as much negative camber as the front. Although it is chassis dependent, you will find that the factory rear components allow alignment technicians to dial in a reasonable amount of negative camber, and aftermarket camber arms are rarely required. Most vehicles will offer up just north of two degrees of negative camber at the rear, and that is typically enough of a range to suit most enthusiasts needs. 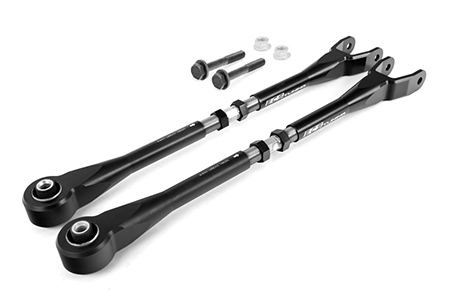 If more adjustability is desired, you will have to move toward purchasing and installing aftermarket rear camber arms. Now that we have discussed the basics of camber and how to acquire it, let’s talk about tuning. Checking your tire wear patterns frequently will help you understand more about your driving style and how to adjust camber settings to improve performance. Beyond wear patterns, checking your tire temperatures promptly after you have exited the race track with a tire pyrometer can be very indicative of what adjustments need to be made. We suggest keeping a logbook with you in the paddock, where notes can be compiled over the course of a season. Keep in mind driving style may change as you gain more experience or instruction, the car may be further modified, and one track location to another may alter your results. If the shoulders of the tires are wearing significantly in relation to the rest of the tire, and give off higher temperature readings, you need to add more negative camber. If the inside of the tire tread is wearing and giving off higher temperature readings, you have too much camber. A nice, even wear pattern where tire temperatures are relatively consistent is the ultimate goal. 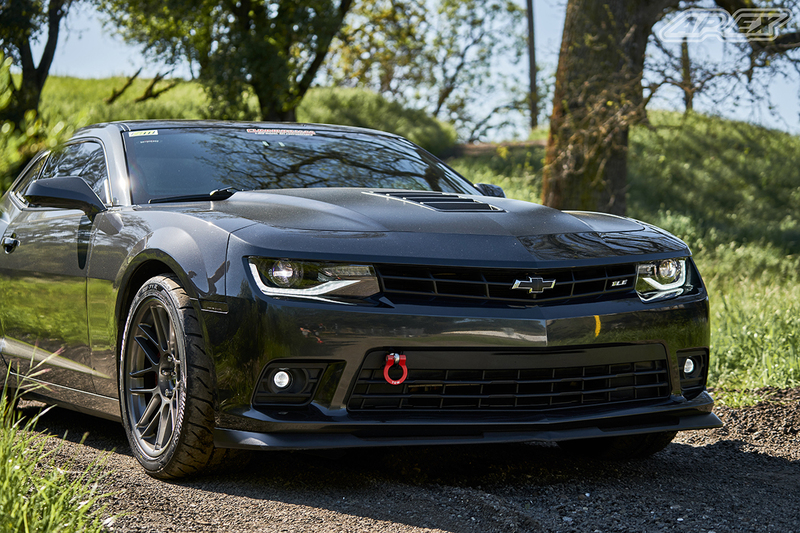 At the end of the day, camber settings have a dramatic impact on increasing mechanical grip and promoting consistent tire wear, and remains one one of the most influential factors to a well performing chassis. Dialing in the right amount of negative camber for your specific needs will provide you with more confidence behind the wheel, and the only thing left to do is to get out and start logging some seat time to find your sweet spot!